Prescription opioid use has increased in Québec in recent years. In view of the serious consequences stemming from drug misuse in this pharmacological class, it is possible that the increase has affected the temporal trend in opioid-related poisoning deaths. Determine the opioid-related poisoning death rates in Québec and describe the temporal evolution of the phenomenon by age, gender of the deceased, manner of death, and type of opioid involved. A retrospective trend analysis of poisoning-related death rates from 1990 to 2009 in the population 20 years of age or over. The death registry of the Registre des événements démographiques and the computerized database of the Bureau du coroner en chef du Québec. A Joinpoint Regression analysis used to determine whether significant changes occurred during the period under study and to estimate average annual percentage changes to describe temporal trends. The adjusted rate and specific mortality rate attributable to poisoning. The medical and non medical drug-related poisoning death rates increased in the 2000s. The increase mainly reflects the rise in fatal opioid poisoning both among men (+9.4% on average per year) and women (+10.2% on average per year). The adjusted mortality rate attributable to opioid poisoning among men increased from 1.9 to 3.7 deaths per 100 000 population between 2000 and 2009. The rate among women rose from 1.0 to 2.2 deaths per 100 000 population during the same period. The pace of the increase appears higher among individuals between 50 and 64 years of age (+20.9% on average per year among men and +13.7% on average per year among women) and is related essentially to poisoning by prescription opioids. 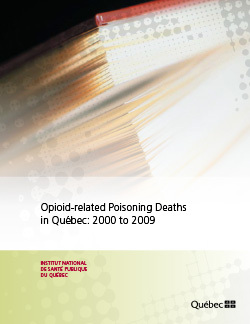 Based on data from the death registry of the Registre des événements démographiques and the Bureau du coroner en chef du Québec, the opioid-related poisoning deaths increased appreciably in Québec between 2000 and 2009. The increase is statistically significant and does not appear to be abating. Physicians, pharmacists, nurses and other professionals working in the field of prevention must be informed of these observations, along with the users of prescription and over-the-counter opioid drugs. The strategies aimed at minimizing the risk of opioid overdoses should be reasserted and, if need be, new strategies could be elaborated.